I have been sitting at home since then doing nothing, and waiting for NYSC that doesn't seem we are doing anytime soon. 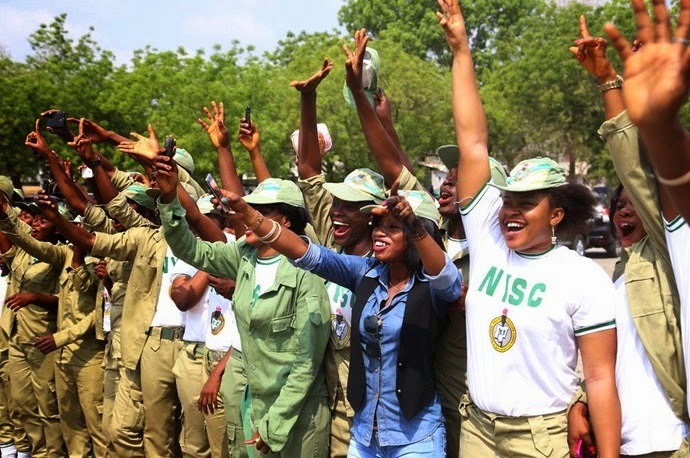 We registered for NYSC around March, and BATCH A Stream 1 time table was out immediately, which they left for camp around May and came out June. 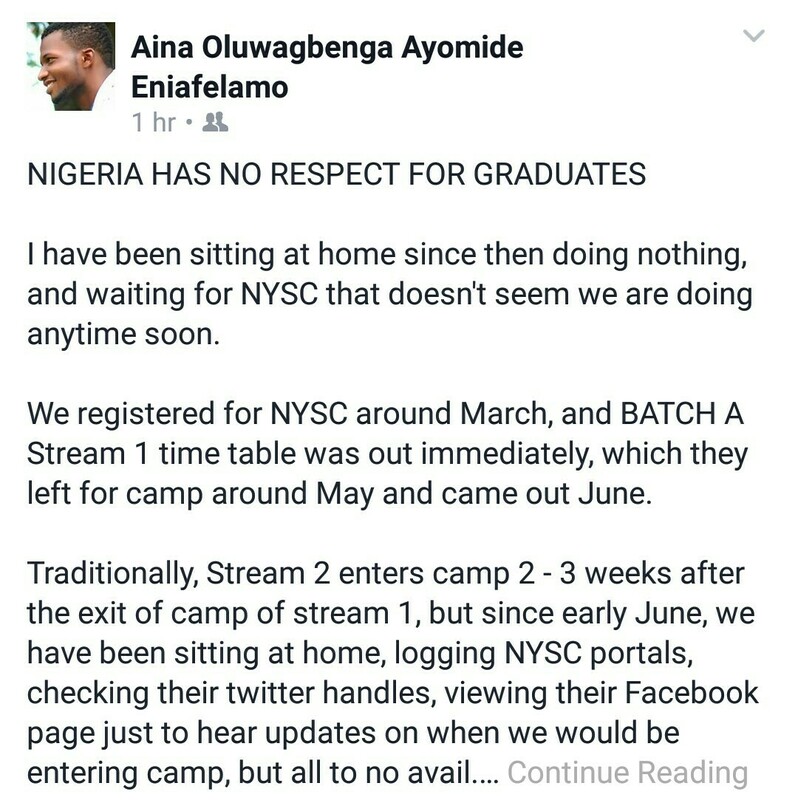 Traditionally, Stream 2 enters camp 2 - 3 weeks after the exit of camp of stream 1, but since early June, we have been sitting at home, logging NYSC portals, checking their twitter handles, viewing their Facebook page just to hear updates on when we would be entering camp, but all to no avail. Some of us want to travel but we can't, because of fear of NYSC can call us. 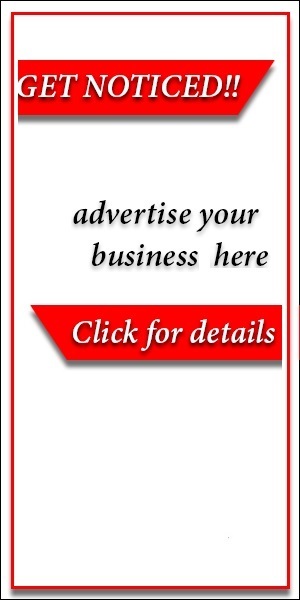 Some want to start business but can't because of fear NYSC can call us. 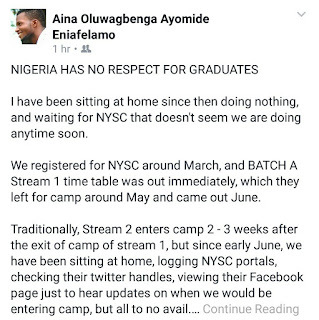 Some want to apply for Jobs, but can't because of NYSC certificate. We have been demanding for explanations from NYSC, but they are turning deaf ears and refusing to even explain the reason for the delay, or bring out our time table for us, so that we will know our fate, because they have no respect for the lives of graduates and they don't care what we have to leave just to wait for NYSC news that doesn't seems coming anytime soon. The DG of NYSC should come out and address us. Enough is enough. We have lives to live, you can't just dump us and leave us like some bin or something. Come out and address Stream 2 corpers.